1956 Colham Ferry Elementary was built in 1956 on the site of it’s predecessor the Rosenwald School. The school was named for E. D. Stroud who was an educator for over fifty years and was opened to serve African American students in grades 1-12. The school’s first principal was Marvin Billups who served for two years. 1958 Theodore Dyson served as principal for seven years. 1965 Principal Lawrence M. Scotland served eighteen years and participated in some of the most significant educational changes in Oconee County, including integration of public schools. 1967 Oconee County integrated it’s public schools. 1968 The school was renamed Oconee County Intermediate School. The school served students in grades 5-7. 1980 Due to county growth, 8th grade was added to Oconee County Intermediate. 1983 Principal Dr. Austine Wallis served for six years. 1988 Fifth grade was moved to Oconee County Elementary School leaving the school with grades 6-8. 1989 Principal Annette Short served for three years. 1992 Principal Bill Brooks served four years. 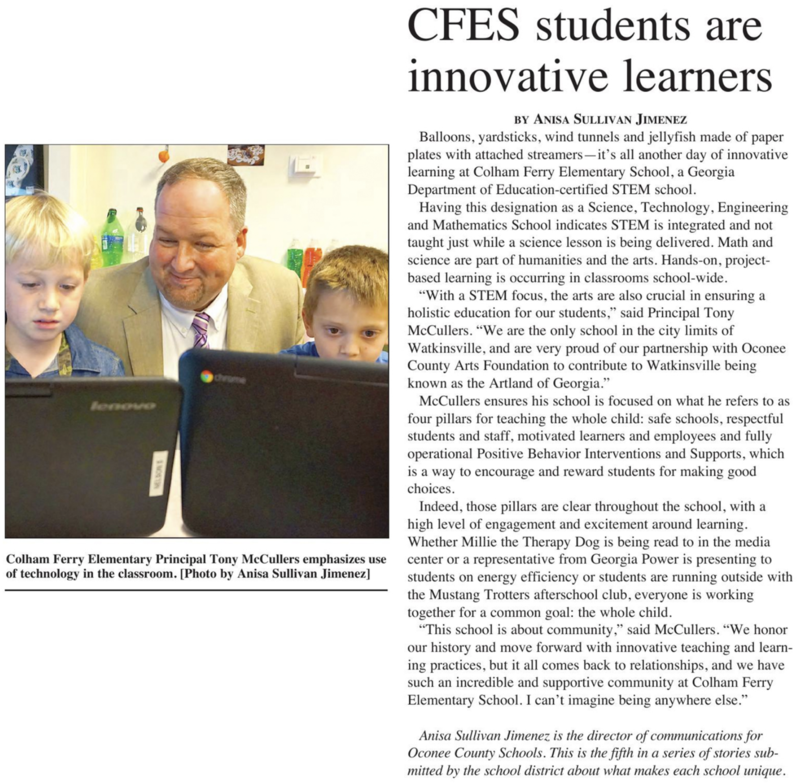 The school served all 4-5th grade students in Oconee County. 1996—2007 Due to county growth, the school was renovated and reopened as Colham Ferry Elementary School serving students in grades K-5. Beginning in 1996 Martha Brodrick served eleven years as principal. 2008-2010 Jackie Carson served three years as principal. 2010-Present Keith Carter serves as principal of Colham Ferry Elementary School.